You glance at the time on the 18-karat gold Apple Watch Edition strapped to your wrist while chatting on your gold iPhone 6 and answering e-mails on your gold iPad. No, you don’t have the Midas touch. Apple is reportedly adding gold to its iPad Air lineup for easier color coordination. High demand for the gold iPhone 5s when it launched last fall proved there’s a market for Apple devices in shades other than space gray and silver. According to Bloomberg, Apple is adding a gold iPad Air to its lineup this year. The mini is reportedly being left out of the metallic makeover. Why gold matters: This isn’t the first time Apple has played with color to entice buyers. Everyone remembers the fruit-colored iMacs of old, with their translucent shells. iPods have long been available in a range of colors. Apple brought that level of personalization to the iPhone last year with the release of the candy-coated 5c. And now that the company has added bigger phones to its roster, it has to bolster its tablets. 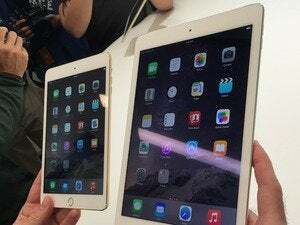 iPad sales have slipped this year, with 13.3 million units sold in the third quarter compared to 14.6 million in the third quarter of 2013. If a gold iPad doesn’t do the trick, various outlets (including Bloomberg) have reported that a 12.9-inch tablet is on its way. It’s unlikely that we’ll see that massive iPad this year, but Touch ID is expected to show up in this month’s anticipated hardware refresh. And while you don’t have to coordinate your iDevices in all their gold glory, why wouldn’t you?